We’re lucky if half of you are still interested enough to open the emails anymore. We’ve been in South Africa for 2 months now and it has been a rollercoaster! Kolt has been creating a website and designing an app for different branches of the organization we’re volunteering with. He’s nearly done with both, which is pretty fantastic considering the internet challenges in our area. Wifi is typically either non-existent or operating at a crawl, so he’s been mostly hotspotting his phone data. At one point his phone stopped working and no one could fix it, that was a real downer. But then, after 10 days or so it miraculously resurrected itself so we just speak extra politely to it now and keep our fingers crossed. Despite the difficulties, Kolt’s been trucking along and his skills are getting put to great use. The lack of corporate red tape lets him see his designs come to life quickly. He’s also been playing in a men’s soccer league and even tried out a round of golf recently; although, I don’t think that will become a regular pastime in the near future. I’ve been volunteering daily at the Genesis Care Centre- a combination hospice, step-down and rehab unit with up to 40 patients at a time. The unit is run by nursing staff with a quick visit from volunteer doctors once every day or two. The docs usually only see 2-3 patients in each of two wards when they stop by, which can leave a gap in care for all the others. My role is to fill the gap. I’m in the wards daily, tracking the patients’ conditions, medications, and progress. I don’t have my medical license in South Africa, so I can’t sign orders or prescriptions, but I can evaluate, consult and bring necessary orders to the doctors to sign when they arrive. I also help with wound dressings and basic things like changing diapers (nappies), feeding, bathing and rehab exercises. I’d be lying if I said that I came prepared for what I see on a daily basis. Medicine is different here, both in access and in attitude. At least ¾ of my patients have HIV, many also have TB, and the conditions they come with are things I only read about at home. As is the case everywhere, culture, economics and education play a huge role. My biggest challenge is trying to switch between fighting for one patient’s life and allowing the next one pass away as comfortably as possible. One of the ways I am coping is by spending 2 mornings a week at the organization’s home for orphaned or abandoned babies (ages 0-4). It’s revitalizing to see and interact with the life and joy of young children. We’ve spent a lot of our time and energy adjusting to life here. South African culture certainly has its challenges, but it is welcoming and open, so making friends has happened pretty quickly. There are some wonderful people around who can explain some of the more confusing nuances. Lately, we’ve been nesting a house that’s about 10 minutes from the church grounds we’re working on. It’s a huge place and the goal is to make it a home for international volunteers like us. The church community has been donating all the big and little necessities and we’ve been settling them in. It’s been wonderful to have our own space for a bit. As an added bonus, the ocean view from the backyard is breathtaking and the African wildlife abounds. Recently we were able to go scuba diving at one of the top 10 dive sites in the world, Aliwal Shoal. While the launch, boat ride, and entry were intense, the dive made them more than worth it! We saw sea turtles, electric rays, and even ran into a pod of curious dolphins. At the end of the dive I even saw a large ragged tooth shark and managed not to go into a blind panic. Kolt and I are currently taking a week off from our work. 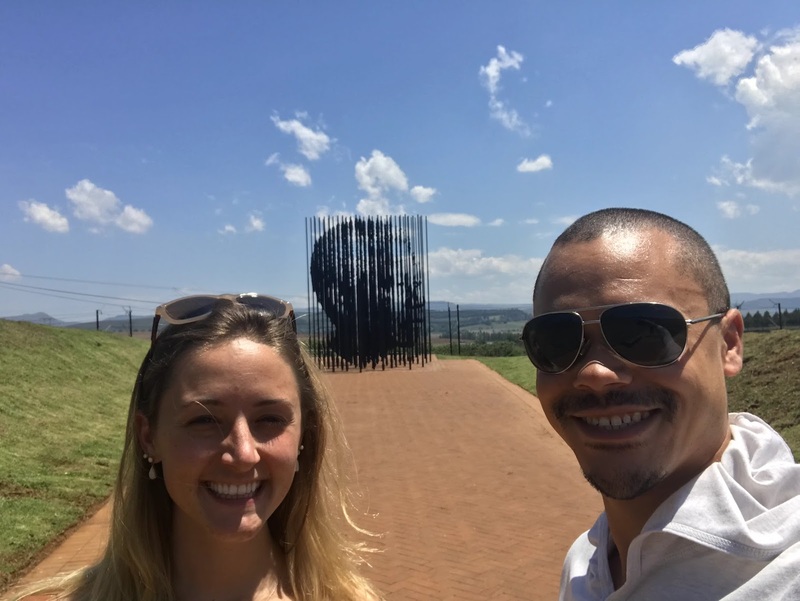 We traveled to the capital city of Pretoria a few days ago so that I could go in person to the government buildings and follow-up on the licensure application that was sent in June. I was also able to meet with a number of people in my profession here (called Clinical Associates) and hear about what challenges they face. It was encouraging to listen to other people passionate about medicine and their role in it, I had nearly forgotten how life-giving that is. They gave me the next steps for pursuing licensure here so I’ve got a to-do list when we get back. We’re wrapping up a 3 day stay in the Drakensberg mountains now, breathing crisp air and hiking under snow-capped peaks. This mini-trip has been a much needed time to reflect on the last 2 and even 5 months and on where we are now- physically, emotionally, spiritually. We’ve been missing our home city, community and families quite a lot and we don’t have any solid answers as to what comes next for us once December rolls around. Regardless of what doors open or what decisions we make, we know that our time here has been shaping us and each challenge we face builds on the lessons we are learning. Thanks for reading, we love you all!